If you're looking for more free books, I'm giving away five copies of "Handwritten Recipes" over on Goodreads. Check it out. I definitely need to improve my cooking skills! Count me in, I love cookbooks! I missed the last cookbook giveaway! Congrats on the cookbook and count me in for the giveaway. Throw my name into the proverbial hat, please and thank you! I have a gazillion cookbooks but could always use a few more! Awesome! Vintage cookbooks are so fun! 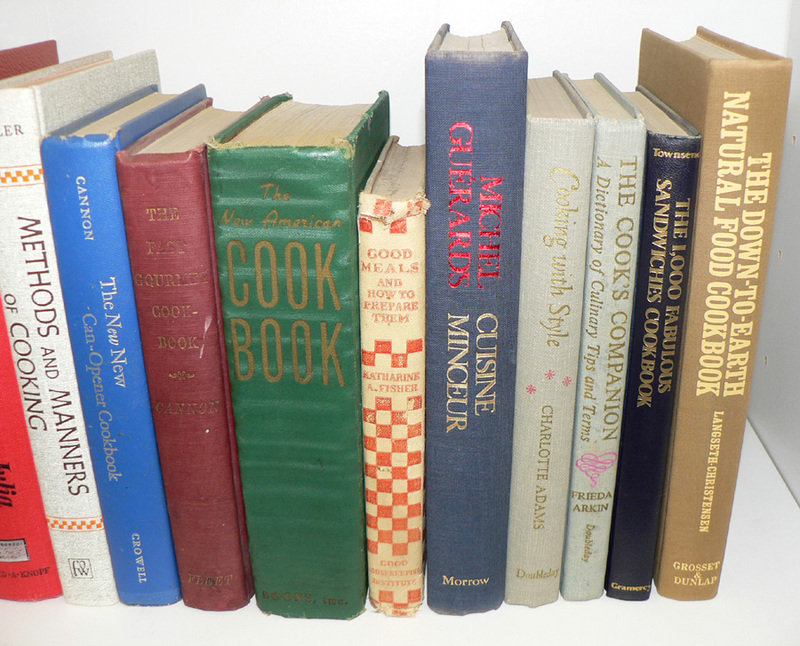 As an avid collector of old and unusual cookbooks, these lucky 13 would fit onto my shelves perfectly! Thanks for the give away! 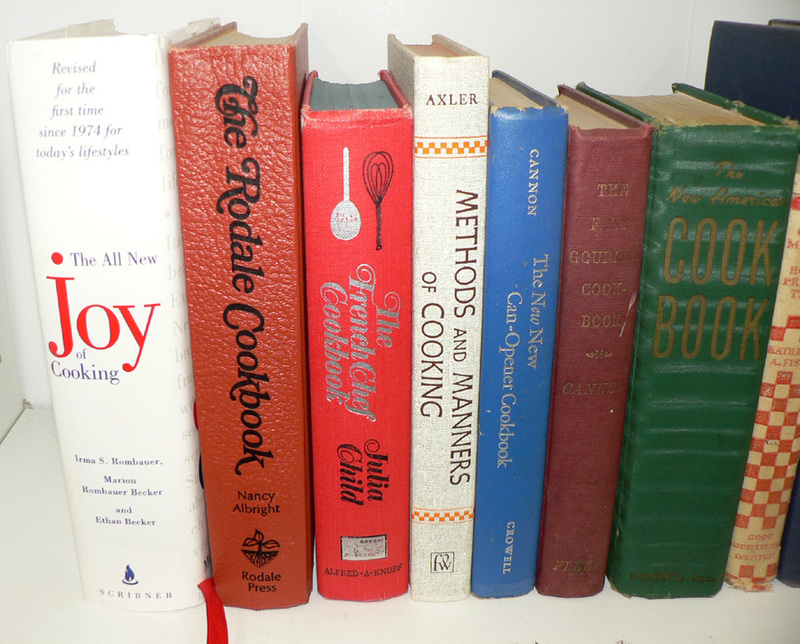 Count me in, i love old cookbooks--What is the name of your upcoming book? That might be the edition of Joy that I all ready have but the others look awesome. how do you write a whole book about sandwiches? Count me in. I would love some recipe inspiration - count me in! Oooohh! This looks wonderful! I love cookbooks! I'm in! I love cookbooks. I would love to be able to add these to my collection. thanks! I LOVE old cookbooks! How fun! this looks great. please count me in for the giveaway. thanks. I'm a firm believe that one can never have enough cookbooks! Great lot! Thanks for the chance! I'm a cookbooks addicted so... PLEASE... count me in for the giveaway! I love cookbooks! Maybe I'll win this time. I love cookbooks! Congrats to you, too! How exciting that you have one coming out too!!! Makes me hungry. Would love more cookbooks. Cookbooks! I just love cookbooks, especially old ones with all thoe interesting dishes to be discovered! One can never have too many cookbooks! Thanks for the giveaway! Count me in for the giveaway please. I am teaching my children to cook and would love to have an extra book to share (and gather more recipes from). I would LOVE to win these cookbooks! Some of my favorite books are the two very battered volumes of Meta Given's Modern Encyclopedia of Cooking from 1955. My mother received them as a wedding present, used them until they fell apart then ensconced them in hideous blue contact paper before passing them on to me. They are amazing and even though I'm a vegetarian I think the section about how to remove feathers from game birds is fascinating -- just in case I'm ever lost in the woods and need to eat! A cook book, or passel there of, is something you can never have too many of. Enter me, if you please. Thank you for the chance to win these books. Good luck with yours. Entering this for my wife, a confirmed cookbook junkie. I'll sign up for my wife! She'd love them.